Astonishing! Scandalous! Sacrilege! Heresy! Sinful! In his ongoing effort to shamelessly hustle votes by trying to be all things to all people, Prime Minister Harper recently tried to pass himself off as a Roman Catholic at the funeral service for former Governor General Romeo Leblanc in Memramcook, New Brunswick by accepting sacramental communion. Given his sparse worldliness, his early background as a frequenter of United and Presbyterian Churches, and his current affiliation with his fellow arch-social conservatives in the Evangelical Christian and Missionary Alliance, it is little wonder that the klutzy Harper found the ceremony quite foreign and confusing to him. Unlike Roman Catholics who rise and gulp the wafer and bolt real vino (if they so wish) when communion is served by the Priest, in Harper’s ho-hum religious world communion involves seated parishioners discretely passing along wafers which each of them consume, together with small glasses of unfermented grape juice. It would appear from a video of the Harper communion that when the Priest gave Harper the wafer, he did not immediately gulp or devour it. He slipped it into his pocket! See it for yourself here: http://www.huffingtonpost.com/2009/07/08/stephen-harper-puts-commu_n_228023.html as it disappears amongst his loose change, kleenex and other personal debris. The Roman Catholic clergy in New Brunswick is up in arms at the insult and is demanding an explanation. The wafer – properly called “the host” in Roman Catholic ritual – is the body and blood of Christ and must be consumed when received. No ifs, ands, or buts. Not only that, in order to receive “the host” you must be a Roman Catholic, unless perhaps there is a real emergency - like imminent death. So with a multitude of Canadian Roman Catholics being irked and upset at the gaffe (or sin, insult, heresy, scandal and/or sacrilege), all of this bodes ill for Harper’s audience with the Pope, expected to take place over the next few days in Rome. Well, Darryl, the Liberal Speaker of the Senate, Noel Kinsella, disagrees with the people who claim that Harper didn't eat the wafer. Noel Kinsella says he saw it with his own eyes. But farbeit for you to not stoop to any or every low in order to garner some kind of partisan advantage out of a non-scandal. A far more credible Kinsella, one Warren Kinsella, says that Noel has mispoke and misseen. I prefer the Warren Kinsella version. It is more consistent with the Klutzy behaviour that Harper is famous for. Besides, Patrick, you worm - Noel Kinsella is as much a Liberal as you are. 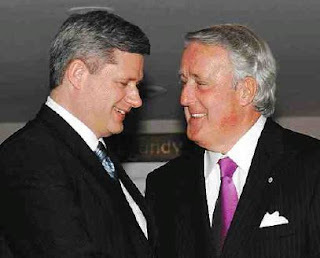 He's a Senator appointed by your hero - you know, the guy who befriended Karlheinz Schreiber and who got money from him - yes, Mulroney. Noel was appointed to the Senate in 1990 as a PC. So check your facts before you try to to engage in a debate - an activity you are not very good at. Do yourself as favor and google Noel Kinsella and see for yourself, you twit.